Non-Members can register after the date shown. Skywatching on a dark winter night high on a mountain ridge overlooking the Coachella Valley and surrounding mountains is an experience you do not want to miss! Due to govt. shutdown, Joshua Tree park is closed. We will go to another location nearby. Joshua Tree National Park has some of the darkest nights in Southern California. 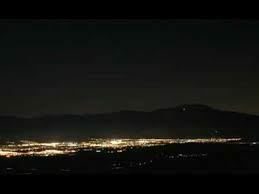 Join us for a night trip into the park to Keys View, where we will have spectacular views of the Coachella Valley under the dark sky. Our skywatching will be led by Robert Victor, astronomy columnist for Coachella Valley Independent. GO member Glenn Suekiel has offered to host a meetup at his house in the town of Joshua Tree. We will have snacks, desserts and hot beverages around the fireplace before heading up into the park. This will be one of our ‘campfire events’ of an evening outdoors with friends. Robert has a new, very portable telescope which is good for wide-angle objects such as Andromeda Galaxy, Double Cluster in Perseus, the Beehive Cluster, the Pleiades Cluster, the Sword of Orion containing the Great Nebula, and more. Robert C. Victor was a staff astronomer at Abrams Planetarium at Michigan State University. He is now retired and a GO member who enjoys providing skywatching opportunities. 4:00 pm - Optional dinner at the Sizzler in Yucca Valley - map click here. 5:00 pm - Meet at Glenn’s house. Address and directions will be provide in your confirmation email after you register. Hot beverages, snacks, and desserts around the fireplace. Bring your travel mug. The Joshua Tree Village is a really small place; you are welcome to arrive early, park here and stroll the village. 5: 40 pm - depart for 35 minute drive to Keys View. 7: 30 pm - depart Keys View back to Glenn’s House for hot beverages and back home. Red Lights Only - Do not use bright white flashlights, headlamps, or cell phones. It takes 20-30 minutes for the human eye to fully adjust to very low light conditions. Bright lights delay this process. You can turn a regular flashlight into a red light by covering it with red cellophane, tape, fabric, paper, or similar materials. Many headlamps have a red light option. Layer Up - Temperatures drop quickly in the evening. Bring extra layers of warm clothing. Carpooling may be available from Glenn’s house to Keys View if offered by drivers. Registration for this event is initially limited to Great Outdoors (GO) members only. If you're not a member, click here to join first. Non members may sign up for this event on beginning January 5th, if space is available. Registration required to acknowledge waiver electronically. Please let us know if you have to cancel so we can fill from the waitlist. Health Problems/allergies: Discuss any medical concerns with the leader that may affect your ability to complete the outing.